Hotel Vina del Sur Tarija. 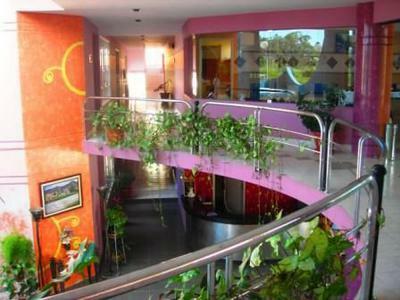 This hotel is located across the Guadalquivir River from the city of Tarija’s downtown area in a quiet, mostly residential neighborhood, about 10 minutes from the bus station (terminal de buses) and airport. It is easily distinguishable by its three royal blue arches. Reception desk staff were friendly at this hotel but the manager would not give us access to any of the rooms, and insisted we view and photograph only the exterior and main service areas. We asked if the hotel was full and it was not, so we’re unsure why the rooms were off-limits. You can see photos on their website. Hotel Viña del Sur is large and well-lighted with some second-story rooms having views of the riverbed, which is dry much of the year, and others facing the hillside behind it. The high-ceilinged lobby is welcoming, as are reception staff and leads to a large rear outdoor pool and garden area with a smaller enclosed heated pool that is open during the winter. 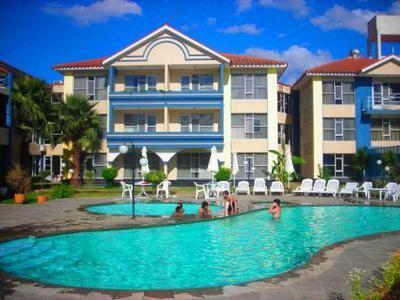 There is also a dry and steam sauna and an ample conference room behind the pool. The hotel has another smaller conference room as well. On the first story you can enjoy a buffet breakfast in a glass-encased panoramic dining room with a view of the pool and surrounding hills. This hotel is large, with 78 rooms of varying sizes (single, double, matrimonial and executive), all equipped with cable TV, phones, heating, air conditioning, wireless internet, and minibars. You can request laundry service, wake-up calls and any other service you need. You’ll find a simple room with 2 computers and Internet access just past the reception desk. The hotel has garage parking for guests. 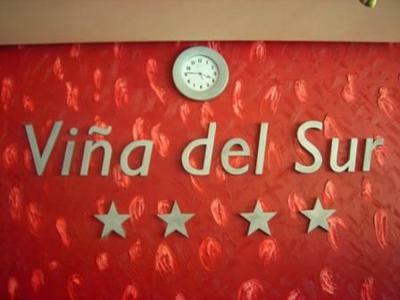 The Prefecture of Tarija gave the Hotel Viña del Sur 4 stars.